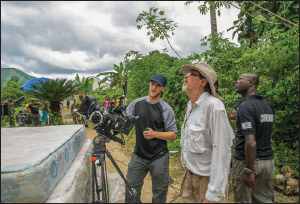 St. Petersburg native and film director, Curtis Graham, is happy to return to his Eden Isle home following a grueling month of filming on location on Oloibiri Island in the Niger Delta. Oloibiri is the site of the first oil well drilled in Nigeria in 1956. Since that time, big oil has come to dominate the Nigerian economy. Curtis served as the director of photography for the movie, and helped to produce the film as part of a joint venture between Greyhouse Films, his St. Petersburg-based production company, and Right Angle Productions, a Canadian film production company. The film is set for release at the 2015 Cannes Film Festival. Samantha Iwowo, a Nigerian living in the UK, wrote the screenplay. 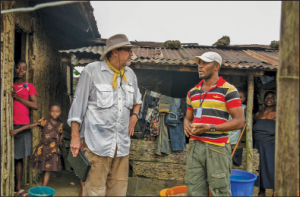 The movie is a narrative piece, explaining the changes brought to the residents of Olobiri by big oil: polluted waters, poisoned fish, infertile crop lands, political corruption and violence. Graham’s film tells the story of one village, whose elders signed on to oil drilling unaware of how this industry would change their lives and their village forever. 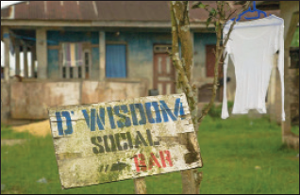 Check out Oloibiri in a theatre near you in 2015! 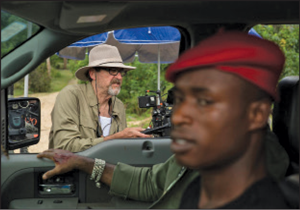 Nigeria currently produces the largest number of films in the world and is commonly referred to as ‘Nollywood.’ However American film production remains the gold standard, and Graham transported a crew of four, toting twenty-seven bags of equipment, to the Niger Delta. Headlining the marquee is the American actor, William Moses. Curtis’ logistics specialist declined the job because of health-related issues. This made it necessary to hire a seasoned film director in Nigeria to act as Curtis’ assistant. The crew from Greyhouse was met at the airport, in Port Harcourt, by government officials who assigned them twenty militia, armed with AK-47s. The militia stuck with them like glue. Graham says that the Niger Delta is notorious for kidnappings and equipment theft. In addition, the Nigerian government had assigned secret service agents to the crew; Curtis did not know this until his final day in the country. He hired some top Nigerian film professionals, and most of the actors were Nigerian. They filmed in mud huts. Humidity was 100%. It rained for three hours every day. The Nigerians spoke rapidly in a foreign dialect. All of the food was cooked in foul smelling palm oil and consisted mostly of tough chicken and rice; Curtis lost weight. There was the poorest of infrastructure. Curtis and crew stayed in an unfinished three-story hotel with intermittent running water. There was no access to the internet and no telephone connection. When the government refused to allow the use of blanks, the crew attempted to improvise with firecrackers while shooting the numerous gunfire exchanges. The gunfire will have to be added in the post-effects. This made it necessary to hire a seasoned film director in Nigeria to act as Curtis’ assistant. It was the most difficult assignment for Curtis to date and perhaps one of the most rewarding. The people of Oloibiri were friendly and helpful. They were curious about the filming and crowded around to watch the production each day. When meeting with the tribal king of Oloibiri and the village elders, Curtis was told that he was the hardest working director of photography they had met. Ruing their part in allowing big oil to drill in Oloibiri, the tribal elders shed tears of gratitude, glad that their story is finally being told. For Graham it has been a humbling and moving experience. He returns to St. Petersburg carrying the tory of Oloibiri and its people with him, both in film canisters and in his heart. Since 1895, when Curtis Graham’s great-great grandfather moved to St. Petersburg from Indiana, the family has had a presence here. Curtis’ father, Phil Graham, opened a photography business in St. Pete in 1948. At the age of fifteen, Curtis went to work for his father, taking pictures. He is an alumnus of St. Petersburg High School, who entertained a desire to become a medical illustrator. Curtis’ father dissuaded him of this and convinced him to become a photographer instead. Curtis moved to Los Angeles to attend the Art Center College of Design. He began doing illustrations for advertising and then got into making commercials. He went back to school at the American Film Institute on a scholarship. His first film, The Blue Men, starring Estelle Parsons, garnered the most awards of any short film in 1990, including the Student Emmy and an Academy Award. Curtis had many offers to stay in Los Angeles, but he wanted to get in on the ground floor of the burgeoning Florida film market. He moved back to St. Petersburg and opened Curtis Graham Photography and, more recently, Greyhouse Films. Greyhouse films has produced six films in seven years, including The Life and Times of John and Mabel Ringling, currently playing at the Ringling Museum and Theatre in Sarasota and Reach Out Recovery, a film about substance abuse, addiction, and recovery. Curtis also produced The Investigator, a feature film about Ray Romano’s brother, an officer with NYPD, struggling to find his way in life. 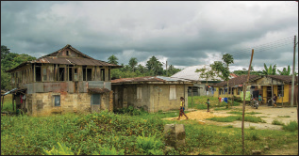 Oloibiri is a small community in Ogbia LGA located in Bayelsa State, in the eastern Niger Delta region of Nigeria. It is about 316 mi (or 509 km) South of Abuja, the country’s capital. 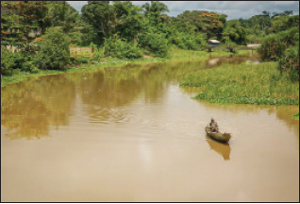 The inhabitants of Oloibiri community are mainly fishermen and farmers. 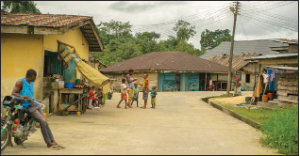 Oloibiri is a historic town to the oil and gas industry in Nigeria. Nigeria’s first commercial oil discovery was made at (Otuabagi/Otuogadi) in Oloibiri district by Shell Darcy on January 15, 1956. Curtis has achieved his goal of notoriety within the Florida film community as well as American cinema, and now in International film arenas. Graham and Greyhouse Films lie at the core of the Tampa Bay film community. He is an exceptionally talented cameraman, easily exceeding Malcolm Gladwell’s 10,000-hour rule for achieving expertise. He is comfortable behind the lens and finds joy in story telling through film. It may be the angle or the light, the shading or the subtleties of movement, but the result is exquisite. Filmmaking is difficult and tedious. Curtis’ usual key grip spent five months underwater with Winter, helping her to acclimate to the camera, before the filming of Dolphin Tale actually commenced. A key grip is responsible for building and maintaining the equipment which supports cameras: tripods, dollies, cranes, tracks, jibs and, as in the case for Dolphin Tale, underwater apparatus. The grips and countless other crucial players are invisible to the movie audience until the credits start to roll. As we conclude our interview, Curtis receives a call informing him that the film drive in Nigeria has crashed. Not to worry, there is a copy of the film here in St. Petersburg. Now he will pour hours into the editing process, aiming to meet a December deadline. He just may be the hardest working and most inventive director of photography in the film industry, and we are fortunate to call him our neighbor. Jenni Lockwood, MSW, has recently moved to the Old Northeast from Portland, Oregon with her husband, Bob. She is an alumna of Wellesley College and a member of the International Taoist Tai Chi Society. I just watched the trailer and I’m really impressed ay. I am just glad that the natives of Oloibiri finally have their story told. Big ups to the cast and crew! Curtis Graham, you are trully a gift to mankind. It’s wonderful reading about your success Curtis. I used to babysit for you and Susan when I worked at this studio for Phil and Francis as a colorist during my teenage years. I am still painting portraits in oil and I’m grateful to your parents for all they did to start me on a journey in portrait art. I loved them both! Curtis Graham is one the most important people in my life responsible for my film career starting at Cracker Prod and on to Hollywood Ca working on over 70 major film productions over the past 27 years !! Curtis can see light better than anyone in the business his eye for compositions is unheralded !! He is a Great Man who Loves and serves The Lord. For this I will always be in debt !! Curtis Graham is “The Man “ Who taught me my craft and fueled my fire for film. Thanking you from The Top of My Heart. Love You like a Brother !